U.S. Rep. Mike Michaud, D-Maine, speaks to a crowd at the Maine Chinese Conference at Husson University in Bangor on Saturday, Oct. 27, 2012. 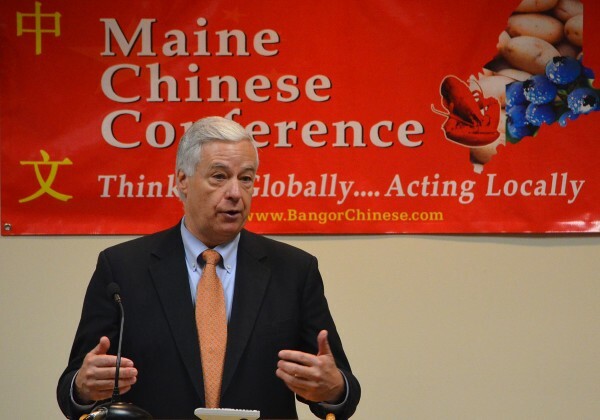 BANGOR, Maine — U.S. Rep. Mike Michaud, D-Maine, said during the Maine Chinese Conference at Husson University on Saturday that having a balanced playing field in trade between the United States and China is necessary for both countries to thrive. “Doing so is key to a more balanced and more prosperous relationships between our two countries,” said Michaud. The Maine Chinese Conference held its last of two days in the Dyke Center for Family Business at Husson University. Friday’s discussions focused on education, while business was the focus for Saturday. The conference was sponsored by the Chinese Language and Culture Center of Maine and the Bangor Chinese School. Michaud said understanding cultures is important for trade practices. Understanding the differences between American and Chinese culture is key to negotiations, said Corinne Young, visiting presidential global scholar at Husson University. She said Chinese have a long courting process when trying to negotiate deals, and Americans typically like quick meetings. One side not understanding the other can lead to unintended problems that could break a business negotiation. Young said knowing as much as you can about where and who you are making a deal with makes a big difference. Michaud said he is working to help Maine businesses sell to China. He brought up the Trans-Pacific Partnership Agreement, a free trade agreement currently being negotiated among countries in North America, South America, Asia and Australia. Even with tariffs, China and Vietnam are first and second in the world, respectively, in athletic footwear productions. Michaud said taking those tariffs away could cost Mainers between 800 to 900 jobs at three New Balance factories in Skowhegan, Norridgewock and Norway. Last month, U.S. Trade Representative Ron Kirk visited a New Balance factory in Norridgewock to see how shoes were made in Maine. He said if tariffs on imported goods are removed in the Trans-Pacific Partnership, the United States would lose about $17 billion. Adding to trade problems, said Michaud, with China and Vietnam is currency manipulation — the act of keeping a country’s currency artificially low in order to sell more goods.